The nominees for this year's Twin Cities Titans in Social Media competition have just been announced at Judy Grundstrom's blog, JustJudyJudyJudy. Judy, who organized the competition, will be judging the nominees with the help of two of last year’s winners, (our editor) Kate Iverson and David Erickson. The winners will be announced at an event on Thursday, December 9th at the Rogue Buddha Gallery. 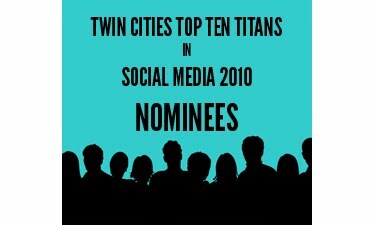 The judges are going to have a really difficult time deciding who the "Titan" is, since there is over 40 nominees! Here's just a few of them; you can review the full list here.